Recd. of Capt. Sylvester, Thirteen Dollars on up and back freight of this trip. Recd Capt. Sylvester $26.29, it being for the two last freights. Recd. of Capt. Sylvester $7.23, it being for A. P. Percy. I believe Capt. E. Sylvester was Capt. Ellis Percy Sylvester of Phippsburg. G. H. Duly was likely George Hampton Duley, also of Phippsburg. 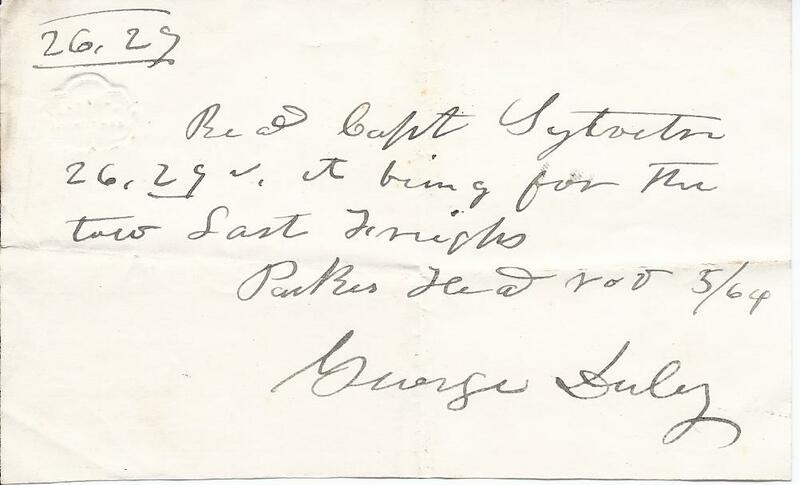 Most records I found had George's surname spelled as Duley, but it's interesting that he signed it himself as Duly. 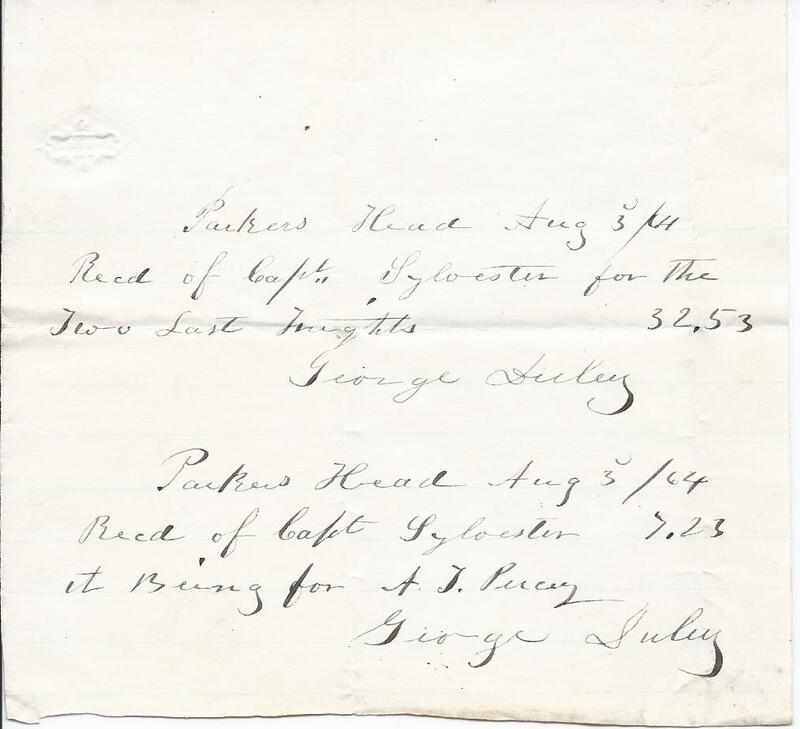 To make things even more interesting, the Phippsburg Historical Society records records page indicates that the name was Dudly in Ireland. Sea Captain Ellis Percy Sylvester was born 1 December 1818 at Phippsburg, Maine, the son of Turner and Jane (Percy) Sylvester. His paternal grandparents were Nathaniel and Sylvia (Sprague) Sylvester. His maternal grandparents were Thomas and Martha (Gilmore) Percy. 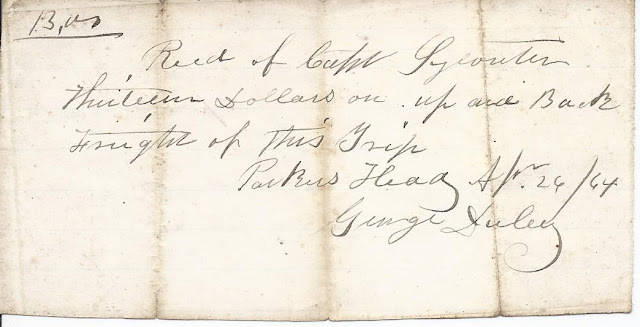 On 24 May 1846 at Phippsburg, Maine, he married Martha Ann Getchell, daughter of Major Walker Getchell and Anna (Butler) Getchell. She was born 23 May 1828 at Phippsburg, Maine. They lived their lives at Phippsburg, where they raised at least five children. George Hampton Duley was born 9 June 1825 at Phippsburg, Maine, son of James and Agnes (Oliver) Duley. His paternal grandparents were Michael and Ruth (Whalen) Duley. His maternal grandparents were William and Eliabeth (Young) Oliver. On 23 October 1867 at Bath, Maine, George Hampton Duley married Frances R. Farnham. I don't have the names of her parents but there were Farnham families in the Sagadahoc and Lincoln County area. The 1860 Census of Bath shows Frances living with James and Elizabeth Oliver and their 3 year old son Edward and described as an assistant. I couldn't find her in the 1850 Census, which perhaps would have given her parents. 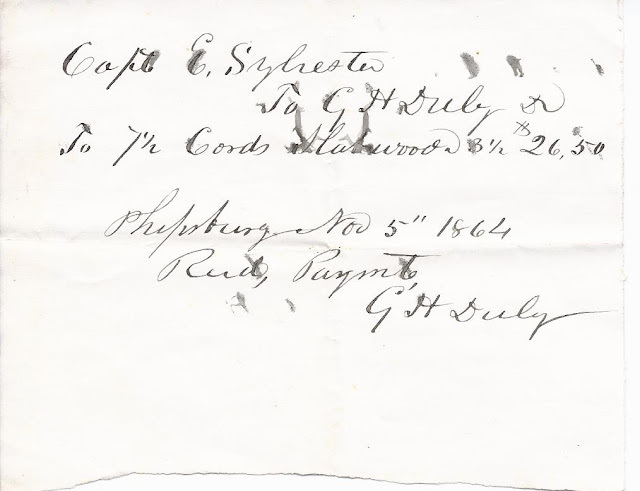 If you have any corrections, additions or insights regarding the Sylvester and Duley families of coastal Maine, please leave a comment or contact me directly. Hello. I don’t know if you’ll see this, as it was originally posted in 2012, but my name is Stephanie Duley. My father’s name was Todd Farnham Duley, and his father’s name was Ralph Duley (not sure of the middle name). I think what you are showing is how the Duley’s and Farnham’s connection came to be. I would love to learn more about the family history. I currently live in South Portland, Maine. 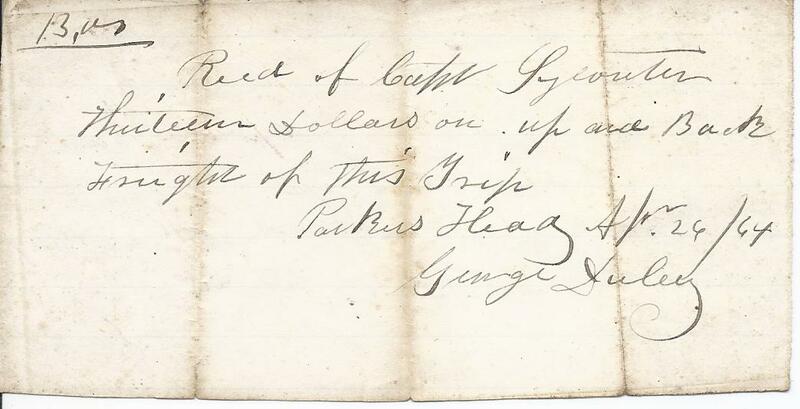 Love how old documents can unravel mysteries and make connections! Sorry that I don't have more info for you but my research was on the Internet, and most of that info is probably already known to you. A lot of new records have come online in the past few years, so it might be worth checking again - I use mostly FamilySearch.org, Ancestry.com, FindaGrave.com and a lot of googling.